Sometimes you need the flexibility to add or change devices to your print network at short notice, whether increasing your print capacity or trialing additional Multifunction Devices (MFDs). PaperCut MF enables the easy implementation of new MFDs to get your print environment operational. To help make this simpler, you can exceed your available device licenses for up to 7 days to assist in the expansion of your print environment. Q How can I find my license information and Support ID? 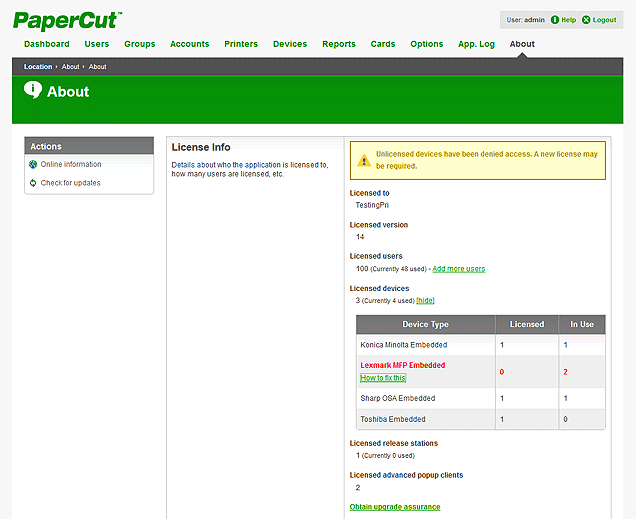 To see your license details, log into the PaperCut Admin and then from the top menu, select About. Scroll down to the �License Info� section to see the number of devices and users licensed as well as how many licenses of those are in use. You can also find the number of licenses for release stations and advanced client pop-ups, the issuing details and your Support ID. Please quote your Support ID when contacting PaperCut with any license query. Q How will I know if I’ve exceeded my device license limit? If PaperCut detects that you have exceeded your licenses when you are installing a new device as shown above, the software will notify you that an additional device license is required within the next 7 days. Note: PaperCut MF is licensed both by the number of user accounts as well as the number of devices. Double check that the license alert you see is for your devices and not a user license exception. See this KB article for more on exceeding your user license limit. 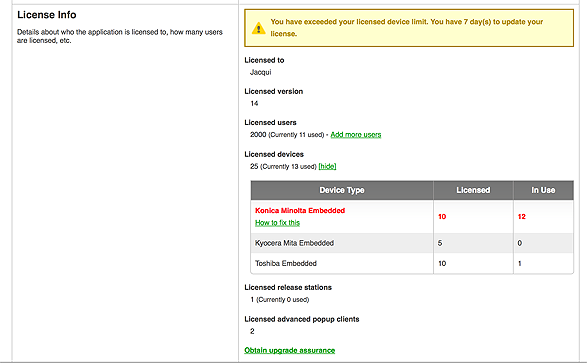 Q What happens when/if I exceed my device license limit? If the number of devices is exceeded, PaperCut will allow a 7 day grace period to determine the optimal number of licenses and update your infrastructure. During this time, you will have full use of all PaperCut features on the device, including reporting. Your PaperCut reseller can help you test and integrate if you need assistance. They can also provide you with additional licenses during the grace period to ensure continuity with your users. 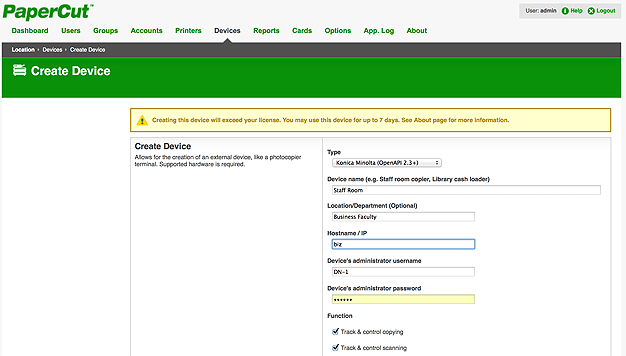 If the device remains unlicensed after 7 days, PaperCut MF will no longer allow users to login at the device. Updating your license will allow you to continue its use. Q: How can I resolve my excess devices on my network? 2) If you are expanding your network and all connected devices are still required, you will need to increase the number of device licenses. To purchase an additional license, contact your PaperCut reseller. If you are unsure who your reseller is contact one of our Authorized Solution Centers, or email our sales team to assist you. Q What if I am phasing out a device and replacing with a new device? If devices are superseded and replaced by a device of the same brand, simply uninstall the older device and install the new device to replace that license. If however you are changing device brands, you will be eligible for upgrades at a discounted rate. Contact your Authorized Solution Center for more information. Q How do I install the new device license? PaperCut licenses are supplied as a digitally signed license file. Check out “How to install your license” for detailed information. Q How can I get notified about excess devices without having to login to the PaperCut interface? 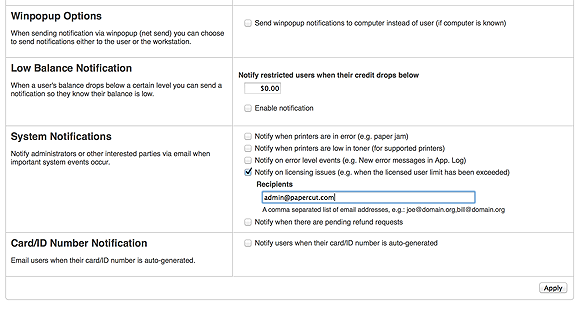 You can set up PaperCut MF to automatically email you or your reseller if the license limit is exceeded. See the Options → Notifications section.